Americans are always frustrated with the efforts of political minds who collect millions in campaign donations via credit cards and cash donations, and then turn around and ask for even more. This year was more evident that in recent years, with so many Americans concerned about a poor economy and what many believe is a combination of poor leadership, irresponsible and unethical political leaders and a general “unplugging” by what those in higher offices choose to know about the real plight in this country. It comes as little surprise, then, that most of us support aggressive campaign finance reform. The 2012 presidential elections have proven to be the most expensive in American history. And now, those who support campaign finance reform say that the decision handed down by the Supreme Court and basically annihilated years of dedication to change the laws, was a kick in the teeth. It’s also paved the way for big money to further infiltrate the American political process. Advocates say the absence of definitive regulations opens the “floodgates” for Super PACs and “dark money” groups to benefit most from the election process. In October, just before the election, a report was released from the Government Accountability Institute, with the U.S. Attorney’s office playing a role in putting the information together. It spelled out an 8 month investigation and the results of that investigation. The focus was on “potential influence of foreign online campaign donations in House, Senate and presidential elections”. Specifically, though, the report focused on the Obama re-election campaign. The one hundred page report was filled with so many obvious problems with the campaign that could have – and indeed, should have – resulted in at least a closer look. According to GAI, it is the duty of the campaign to “ensure compliance with the law”. Unfortunately, there didn’t appear to be much of that going on; in fact, criminal prosecution in some instances could have been pursued. The Obama campaign raised $181 million in September with less than 2% of those donations totaling $200 or more. If a donation totals $200, it must be reported to the FEC. That means the vast majority of the $181 million raised in September did not have to be reported. But it got worse. Few of them required the user key the CVV code that’s designed to protect consumers and credit card companies. If you bought any of the Obama swag, checking out through the online store required the CVV code, the donations? Not at all. That means, most of donations could have come from overseas donors, which is against the law. So why didn’t anyone pursue these claims? In fact, why didn’t the Obama campaign pursue these claims? After all, many would set about disproving, them if those kinds of accusations were being made about them, right? The report was released, reported on one network and then nothing. We’ve not heard a single word since then. These are the kinds of frustrations many feel with campaign finance reform. Ever heard of Sheldon Adelson? He’s owns many casinos and is quite successful. That was made clear when he donated a whopping $53 million of his own money to conservative candidates. That’s a massive amount of money to sink into a political campaign that really, when it comes right down to it, can’t possibly provide $53 million in value. Worse, most of the candidates Adelson supported lost their respective elections. Another massive donation, this time courtesy of Karl Rove’s high-profile Crossroads groups, kicked a cool $300 million into various campaigns in 2012. His return? Just slightly more than one percent. Clearly, money doesn’t buys happiness. The Center for Responsive Politics senior fellow Bob Biersaick stated what millions of Americans have known all along: when big money is involved, it forces attention away from the issues and instead, forces candidates to hobknob and belly up to the bar with those big campaign donors. 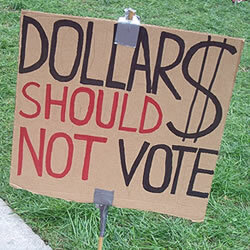 It’s never been true that votes are a simple function of dollars. It’s much more complicated than that. Biersack says that the pressure of big outside money forced candidates to lose a sense of priorities. He said that’s dangerous because it shows only that the nation’s wealthiest can still “dominate the process”. But don’t get lost in the big campaign issues; on local levels in many states, there are those making progress in smaller ways. One group in North Carolina raised more than one million dollars to support a Republican judge, who won in a very close race. That meant conservatives were able to maintain their majority in the state from a legal perspective. Luckily, more Americans are beginning to turn their attention – and frustration – to campaign finance. With the study on foreign donors in the Obama campaign and the inability to now track millions of credit card transactions, to the realization that these big donors can play a huge role in how laws are made, carried out and how important issues are affected, this turn in tides is overdue, though welcome as more begin to come together with the common goal of eradicating it once and for all and ensuring a more ethical approach is inserted into American politics. It won’t happen overnight, but for it to not happen at all jeopardizes the country on levels none of us really want to concede. Eighty-three percent of Americans believe there should be at least some limits on the contributions corporations and unions can make, according to an Associated Press poll taken before the elections; however, when it comes to finding those solutions for reforming campaign finance, there are many challenges. Many aren’t aware, but voters in Montana and other states voted for constitutional amendments that would overturn many of these practices. The only problem is that many say it could take years and no one knows the answer on how to lessen the effects of campaign reform until then, short of the candidates signing pledges to not do so. That, of course, has proven to be a wasted effort.